Here we are, mid- April and it appears (I say cautiously) that winter weather has finally come to an end. Predictions for snow for this past weekend veered north, I have tulips and daffodils in full bloom so there – I declare winter is officially over! Another end-of-winter event is also occurring – the Canadian geese are in full flight headed North in search of food and shelter. Their V-shaped flocks are a classic sign of migration – a sight I find both majestic and mesmerizing. 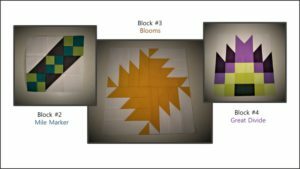 As I continue onward and upward with my Adventure Quilt, I am returning to block 8 which largely consist of a classic pattern aptly named Flying Geese. Like birds during migration I have seen many, many images of “Flying Geese” fabric units but until embarking on this quilt adventure, I had not attempted to piece this eye-catching pattern. So, after spending a couple of hours learning how to make a Flying Geese unit, I can say my Adventure Quilt is “migrating” right along! The image below shows a majority of the quilt blocks I’ve completed. I made an attempt to arrange them to look like the finished quilt on the right. There is LOT going on here, in terms of color and shape so I’ve indicated the actual Flying Geese units with a black oval-shaped circle to allow you to better see where and how this block unit fits into the grand scheme of this quilt. And as a bonus, I’ve placed an image of the finished quilt so we can all see the end goal of this quilt project! This method is likely the oldest, but it is tricky. Each triangle is cut – on the bias – which means a great deal of care needs to be taken to prevent the pieces from stretching while stitching. I am assuming the sheer frustration among early quilters trying to keep all those triangles from stretching reached a boiling point resulting the methods listed below. It is easy to see how the evolution of this technique has made the Traditional method almost, if not entirely, obsolete. To me, this method looks like the easiest. It consists of one rectangle, (the “goose”) and two squares, (the “sky”). The diagonal stitches are made and then the excess is cut away. No cutting or stitching on the bias = no stretching of any piece and the desired size and shape is maintained. There is more about this method in the second tutorial below. Of all the methods listed, this one has the greatest potential to create the most perfect flying geese units. The downside, if you are not familiar with paper or foundation piecing then you will need to learn this process first. This, is a good place to start. If you are an absolute perfectionist, then this is the method for you! This is the method I used as it was the method illustrated in the Adventure Quilt Along. And believe me, there is no waste! See what I mean! What you see above is pretty much the only waste after piecing FOUR flying geese units which measured approx. 2 1/2″ x 4 1/2″. The downside: no wiggle room for an inaccurate seam or cut. You need to start with accurate cuts and sew a consistent scant 1/4″ seam. The result is a unit that only requires a quick trim of the extending points so the “Wing Clipper” ruler is not needed. I like the No-Waste process and appreciate the fact that such a minimal amount of fabric is wasted but I was curious about the Coner Triangle method and decided to give it a try. This way I could compare the two methods to determine the advantage of using one method over another. Same as above except the unit is squared using the Wing Clipper Ruler. Cutting the fabric pieces a bit larger than instructed gives you the extra fabric needed to use the Wing Clipper ruler to get the flying geese unit the perfect size. When you have a pattern calling for several flying geese units of the same size and at least four of those units are to be the same color, the no-waste method is the way to go. 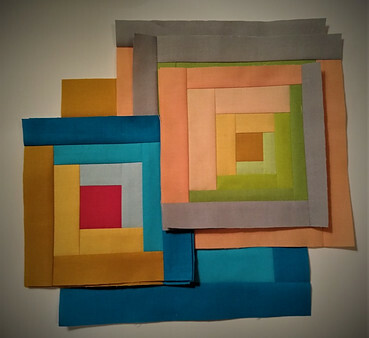 Once you are comfortable with the technique and develop a piecing rhythm the result are four units, pieced at once and in a relatively short period of time. The corner triangle method is faster (from start to finish) however, you can generally only make one unit at a time. 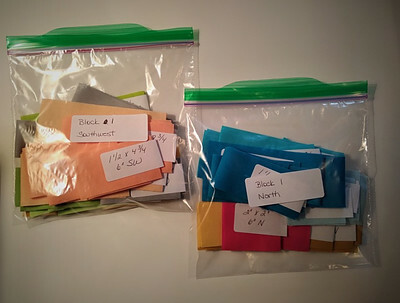 I haven’t attempted to time these two methods however, I am thinking you could churn out four flying geese units using the corner method in about the same amount of time as it takes to create four units using the no-waste method. For fun, has anyone ever set a stop watch and timed to compare these two methods? Although I am curious, I lack a sufficient level of curiosity to take on this challenge myself so for anyone who reads this and is also curious and has the motivation to do a timed comparison please feel free to post your result in the comments below. Each one of us who spends a significant amount of time in “Quilt World” is always on the look out for a more efficient way to use our time, money and resources! That’s Right – a Simple $14.95 Purchase Has Changed My Life! Achieving a consistent 1/4″ seam is THE foundation for accurately piecing most every quilt top you make. 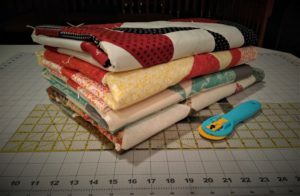 The above statement is nothing new but what I have discovered – just today before beginning the strip piecing portion for Block 8 of my weekly Adventure Quilt Along – is that using my 1/4″ presser foot was NOT the ticket to achieving a consistent 1/4″ seam! All this time…and yes, I did wonder now and then, if I am actually keeping my fabric against the metal “fence” of this presser foot, how and why were my seams ending up a smidgen wider than they should be. What was I doing wrong? Turns out, the problem was not entirely me, but the presser foot I was using. 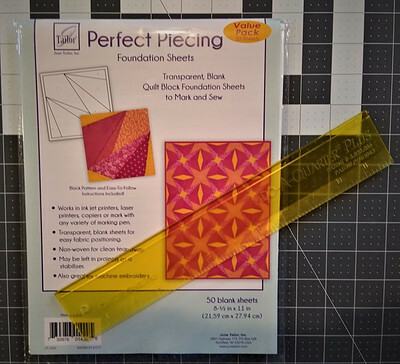 In my previous post I mentioned a potential purchase of the Perfect Piecing Seam Guide and the reusable vinyl Sewing Edge. At that time I wasn’t sure the benefits of such a purchase would outweigh the price since I already had that “wonderful” 1/4″ presser foot. I also mentioned that I have a hard time walking past any quilting / sewing tool or notion that I feel I can’t live without and this was no exception! On a whim I made this purchase and let it sit on my sewing table for a few days. My thought: I’ll open it up and give it a try when I’m in the mood to try something new…someday. Fast forward about a week – that day has arrived! 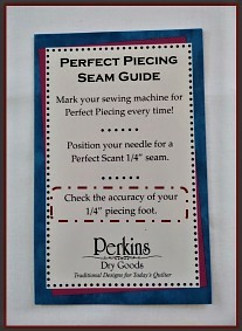 It was the following words on the label of the Perkins Perfect Piecing Seam Guide that caught my attention, “Check the accuracy of your 1/4″ piecing foot”. Hmmm…it never, ever occurred to me that my 1/4″ piecing foot was anything but accurate – after all, 1/4″ is in its name for gosh’s sake! Now, I’m curious. I’ve got know if my 1/4″ piecing foot is accurate. Following the instructions, (with the 1/4″ piecing foot in place) I placed the guide on the footplate and lowered the needle into the hole. The edge of the seam guide doesn’t come anywhere near the fence on the 1/4: piecing foot! In spite of poor lighting, the image above is my attempt to illustrate this distance between the ruler and the metal fence on the 1/4″ piecing foot. The purpose of the fence is to act as a guide, the idea being as long as your fabric ran against this fence you are assured of a perfect 1/4″ seam. Imagine my surprise when I discovered what I consider a huge gap of empty space between the ruler’s edge and the fence! I’ve placed the tip of one of my lint brushes to fill in this in the gap. 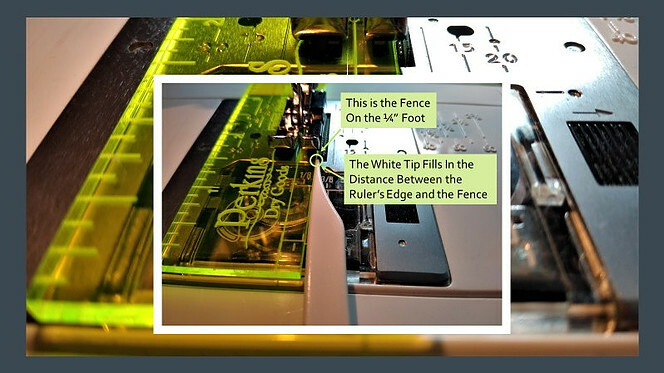 If the 1/4″ presser foot was really 1/4″ from the needle there wouldn’t be any space whatsoever – nothing should be filling this gap between the right edge of the ruler and the metal fence. I’ve tried painter’s tape, masking tape, etc., and I suppose they would do in a pinch but these sewing edge vinyl strips are WAY better! They are just the right amount of thickness and the adhesive is strong yet easy to lift off and re position as needed to get perfect alignment along the length of this strip. Once the strip is in place, remove the ruler and begin sewing! The fabric strip set consisting of 1 red and 2 white strips when sewn together are to measure 6 1/2″ wide. I can’t remember the last time (if ever) that I was able to sew a consistent 1/4″ seam the full length of a 20″ or so strip set! 1) Even if you feel sewing an accurate scant 1/4″ seam is no longer a problem or an issue of any kind, it may be beneficial to go ahead and at least use the Perfect Piecing Seam Guide to check and make sure the 1/4″ mark you are using is accurate. When you do check this, I hope you aren’t as surprised by the results as I was! It’s much easier to create an accurate seam marking before you start a project than regret it later when seams don’t match up and you aren’t able to figure out why. 2) I’ll be tossing the 1/4″ piecing foot aside – way off to the side! From now on, I be using my walking or even feed foot (pretty much exclusively) and keeping that pretty purple strip in place! As thankful as I am for these wonderful products, I can’t help but wonder why quilters have to bother with this in the first place. Every sewing machine I’ve ever used has a marking for pretty much every seam allowance imaginable but NONE have a marking indicating a 1/4″ seam – NOT ONE. Is it fruitless to expect sewing machine manufacturers to wake up and realize the necessity of having a 1/4″ clearly indicated on the footplate? And let’s suppose they do wake up, is it unreasonable to expect them to take the next step and acknowledge this need by including this 1/4″ mark on all footplates? And why isn’t this marking there already? So many unanswered questions however, one main question has been answered: Purchasing the Perfect Seam Guide and Sewing Edge Vinyl Strips is the best $14.95 I’ve ever spent! What is the one quilting or sewing item you cannot live without? To learn more about this product go here. The Adventure Quilt A Long …a Road Trip has become quite a learning experience and has proven to be every bit as educational as adventurous. I’ve learned how to: 1) develop a system of organization, 2) discovered additional uses for a walking foot and 3) piece several blocks using new-to-me techniques – the most educational and adventurous being Paper Piecing! For anyone even vaguely familiar with paper piecing I’ll, put your mind at ease…this is NOT a tutorial or even a hint of an attempt of any form or fashion to explain ANY aspect of paper piecing. When comparing this piecing technique to basic and straight forward stitching of two pieces of fabric together, paper piecing is like nothing you have ever done or seen before. It will cause your mind to bend and twist – maybe even turn inside out! The same effect that learning a new language has on my brain! However, once you’ve overcome that one small hurdle, it becomes evident that paper piecing is actually easy. (To this moment I continue to be amazed at the genius that developed this technique!). Once you master the paper piecing you will not only experience a huge sense of accomplishment but you will also find that it is the absolute best way to make sure your points line up and the only way to piece irregular shapes to create a consistent block design. 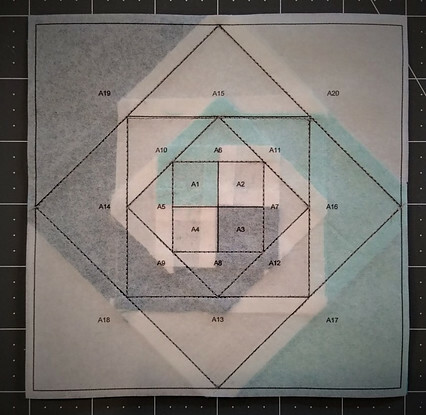 For those of you interested in learning more about how exactly paper piecing is done there are WONDERFUL video tutorials out there in the blogosphere! A simple google search will have you connected in no time. Once you do, just try it! Simply go ahead, pull out some fabric scraps, print off or trace a pattern onto fairly thin paper and give it a try. 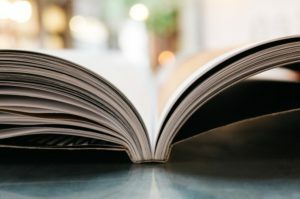 The fear of making a make a mistake or two (or learning opportunities as I like to call them), should not hold you back from at least attempting paper piecing – mistakes at the beginning are inevitable and simply a part of the process. Everyone that has learned how to paper piece – especially those of us who are self-taught, learned the process by making mistakes. Learning what not to do is as educational as what to do. What I do want to discuss are justifications for purchasing a few specialty quilting items. This message is especially for those of you currently participating in the Quilt Along or for those who are contemplating making this quilt at a later date and are not sure whether to make additional purchases for this project. I will admit, I’ve never met a quilting/sewing notion (or kitchen gadget) that I didn’t like! Before starting this journey I first read through the list of optional / specialty items suggested for this project and noticed a few I didn’t have. Oh joy! I’m all about any reason to buy a new quilting-sewing-thingy! For those of us who still struggle with sewing perfect 1/4″ seams these items should be at or near the top of our list. Of all the specialty items listed in this quilt along materials list, the seam guide and vinyl edges are the only items I don’t have. And it’s not because I am perfect and sew a perfect 1/4″ seam every time…oh no…that’s not me! However, I have found that as long as I take my time, use my 1/4″ seam foot or correctly locate a “mark” on another presser foot, achieving a consistent 1/4″ seam isn’t as difficult as it used to be. In any event, I am still intrigued by this product and may have to purchase it anyway – I’m always in the market for that game changing, live-saving, cannot-live-without quilting tool or notion and this could very well be it! THE TOOLS YOU DO NEED! 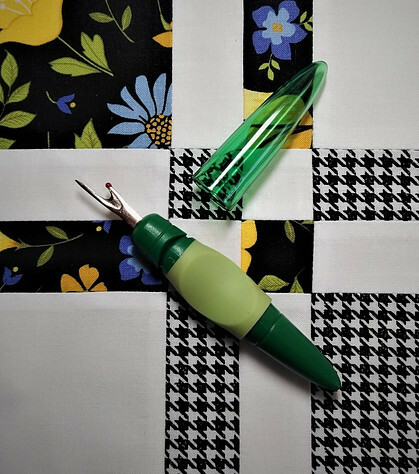 These two items go hand-in-hand with the paper piecing technique. Yes, can make do with a standard quilting ruler (for example, a 2.5″ x 12.5″ ruler). After all, it has markings all over the place for 1/4″ and I do use my 2.5″ x 12.5″ ruler ALL THE TIME but I have discovered the unique design of this handy ruler assures a consistent and accurate 1/4″ cut every time. Again, I will not go into the specifics of paper piecing here but I feel only fair to share these images below to give you the idea of how the folded paper and Add-A-Quarter ruler are used to position and trim before each seam is sewn. The image below will show you the appearance of a finished block with the paper attached. The Letter/Number combinations printed on the paper tell you which fabric is used and in what order. And yes, the fabric is sewn directly onto the paper! This technique is another reminder of the importance of developing a system of organization. It cannot be stressed enough the importance to be able to easily and accurately locate the exact fabric pieces as they are needed. Below is the front side of this same block with the paper still attached to the backside. 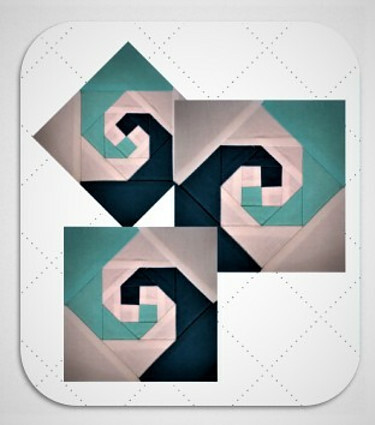 My very first attempt at paper piecing actually began with the block shown below entitled, “RoundAbout”. 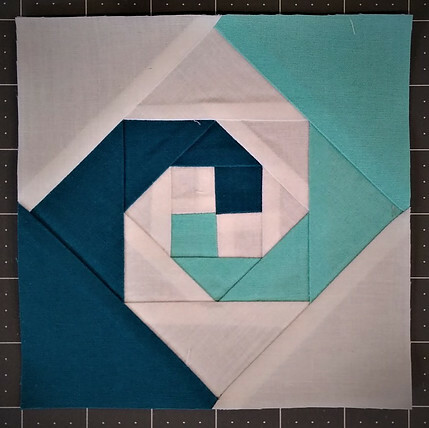 I grabbed a few scraps from my stash and pieced this “practice” block and if this is your first time with paper piecing I would suggest you do the same. 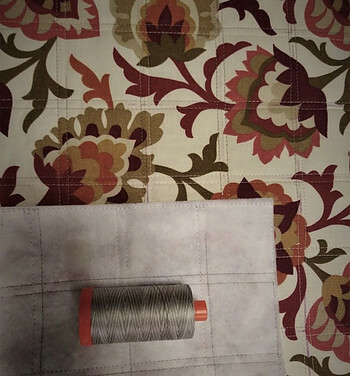 Removing the stress and fear of potentially ruining the fabric you want to include in the final quilt allows you to place more focus on learning the technique. 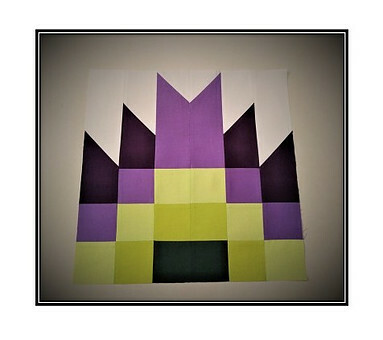 I can’t wait to make this block again using the colorful fabrics I’ve chosen for this quilt. I would love to hear your stories about paper piecing – how you started and how often do you use this technique especially when other options for piecing are available. 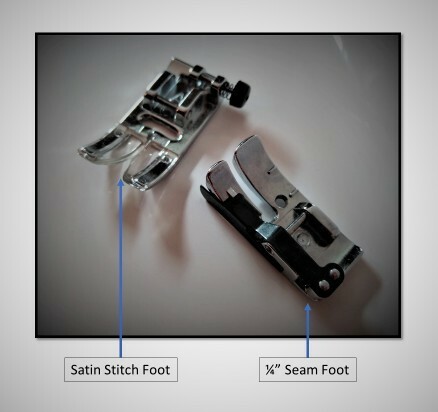 Who knew a big, bulky and (in my case, a clunky sounding) sewing machine attachment that goes by the name “Walking Foot” – also known as an “Even Feed Foot” could could do so much more than help you sew two pieces of fabric together! As much fun as I’m having, I do still suffer a set back or two. This is typically the result of the only real issue I have with my sewing machine – the problem of uneven fabric feed over the feed dogs. No matter how many tips and tricks I try ( and short of simply gluing the pieces together along the entire seam), it “seems” for every 4 seams I stitch that line up, the next will be a good 1/4″ off. I was beginning to think the only reasonable solution was to buy a whole new machine. It was only a few short months ago that I researched quilting machines and at that time I was strongly leaning toward this machine . The primary reason – the feed-dog design that pretty much guarantees an even fabric feed. When Juki redesigned this aspect of the machine it did so to allow both layers of fabric to be fed evenly preventing the all-too-common-reason many quilters have become too frustrated to continue this craft. After all, when one layer of fabric is continuously pulled forward while the other lags behind and the reason has nothing to do with your skill but the less-than-optimal design of the machine, it’s no wonder people are quick to give up piecing or quilting altogether. Learning about this innovative feed-dog design, I was elated to realize that I was not alone – that there were enough of us quilters and sewists out there experiencing this same uneven-fabric-feed problem that an improved feed-dog design had to be developed. However, my happy dance was quickly replaced with the reality that since I do not have that particular brand of machine, I will have to continue to “make-do” and resign myself to the fact that, at least for now, that achieving an even fabric feed on my machine will continue to be as much a fantasy as a source of frustration. That is, until I made this discovery – or rather, the re-discovery of the “Walking Foot“. I say re-discovery as I m quite familiar with this accessory however, I have also been under the mis-guided impression that the walking foot is used only for “quilting”. It’s design will allow several thicknesses of fabric to be smoothly evenly fed through the feed dogs. Using an attachment like this would seem like overkill if used for ordinary sewing. 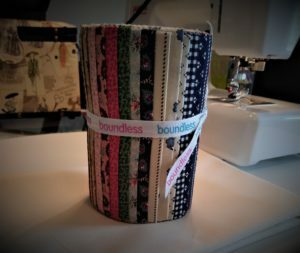 Well, it turns out this big, bulky-doesn’t-look-like-it-belongs-on-a-domestic-sewing-machine accessory is THE solution for an even fabric feed for ALL sewing projects – regardless of the number of fabric layers! I think it is now high time that the word gets out – the Walking Foot should no longer be reserved for “quilting” or sewing together several layers of thickness such as a quilt sandwich. In fact, it may become the only foot I’ll ever use. I say may – I still have a great love for both my satin stitch foot and 1/4″ seam foot shown below. For me, the satin stitch foot works best when sewing fabric together to make half-square triangles (HST’s). I typically cut my fabric pieces a bit larger than required. This gives me some “wiggle room” so if one fabric layer shifts in front of the other and the two layers are not evenly matched at the end of a seam it doesn’t matter. The square will be cut in half and later “squared” to the correct size anyway, so all I have to lose is a little bit of fabric. Blocks #2, #3 and #4 of this Quilt A-Long (shown below) require piecing MANY squares and rectangles which also means nesting and matching up MANY seams. 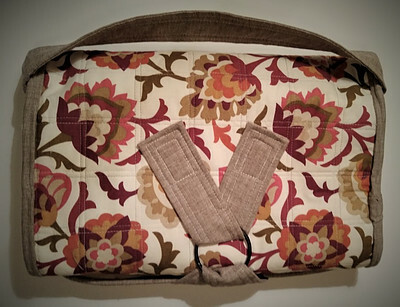 The many trials and errors piecing Block #4 – The Great Divide resulted in the great union between my sewing machine and this miraculous accessory. I would not be as far along in this project as I am were it not for the Walking / Even Feed Foot. Before using my Walking Foot to piece these blocks, my seam ripper was used as much as the sewing machine. After using my Walking Foot, my seam ripper was used ONLY to help stabilize the fabric as it went through the feed dogs. Using a Walking Foot Saves Time: Eliminating the need to rip out seams faster then you can put them in and having to re-do multiple seams is a huge time saver. There is nothing to be gained by doing the same task multiple times. Quilting is a slow but steady progression from one step to the next – it is not a hamster wheel! Using a Walking Foot Saves Money: In my case, it has prevented me from making an expensive purchase that could be postponed until I have more information. Time spent engaging in a thought process and dialogue that affirms your sanity and sense of well-being and allows you to persevere, block by block, until the last block is pieced! Let me hear from you about your experiences using a Walking or Even-Feed Foot for your projects! I’d also love to hear your solutions for achieving an even fabric feed on your machine if you don’t use an even feed or walking foot. The short answer is a resounding YES! Of course, we can! Each one of us can easily “Quilt-A-Long” however, to be successful there are a couple of things you really need to do first. SECOND: Develop a system of organization. I’m not sure this should be item #2 – maybe item #1.2 or something. 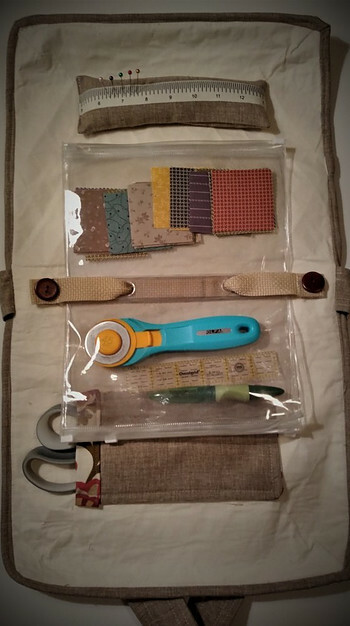 Organization is as important as cutting accurately and sewing consistent 1/4″ seams! 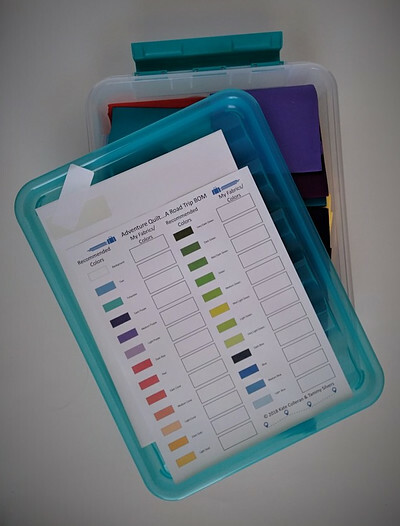 Below is a quick show and tell of the basics I use at the beginning of every project – plastic bin, printed color chart and peel and stick address labels. I am finding this system to be very useful with this particular collection of patterns. There are many squares and rectangles of every dimension imaginable. 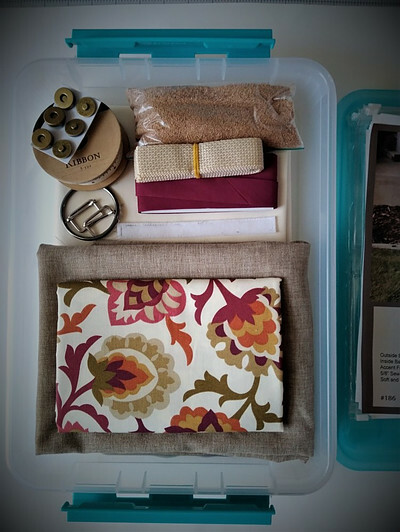 Some vary by only 1/4″ but here is the good news: I developed a few strategies to reduce – maybe even eliminate – the stress and frustration of managing so many small pieces of fabric. So far, winter in the mid-west has been brutal. Snow on top of snow, icy streets and cold temperatures ranging from Arctic to obscene left little convincing that the best way to weather this outdoor insanity Was to stay inside. When it comes to fabric, sewing and quilting I need very little encouragement to spend the day sitting at my sewing machine but I was beginning to feel a little uninspired. Sure, I was finishing this bag project and a few charity quilts but once those are done what would I do next? During my daily internet wanderings I did stumble upon a few QAL’s and BOM’s but there was always some element of the program that I couldn’t work around: A pattern or fabric I didn’t like, the monthly or yearly subscription price tag or the discovery that I was too late to register or so near the end of the program that I would never be able to catch up. No, nothing has changed however, I was able to appreciate at least one (actually, two) silver linings in this past winter’s Polar vortex. Something more inspiring than just staying indoors and online for longer periods of time. The silver lining? The discovery a fun and informative blog – Seams Like A Dream – owned by Kate Colleran, which led me to yet another, (companion?) blog – Tamarinis – owned by Tammy Silvers. As luck would have it, both of these ladies teamed up to create a QAL that I was able to join during WEEK 1 entitled, ” Adventure Quilt Along…a Road Trip Quilt”. A quick read through the requirements and general instructions had me doing a happy dance!!! This is it and it looks like it will be so much fun! Sharing my completed blocks on social media and my website! 2) Showing an image of the finished quilt revealed one of the most beautiful and colorful quilts ever! I still consider myself a “rookie” quilter but I knew right away I needed to make this! Each of these talented ladies constructed a quilt using fabrics from two different collections. Kate used fabrics in solid colors and Tammy used batik printed fabrics. Viewing each quilt I couldn’t decide which I like best – both are outstanding. 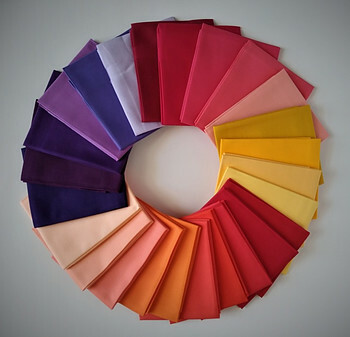 However, history has taught me a valuable lesson when it comes to choosing multiple coordinating fabric colors (or colors of anything for matter) from a computer. Your best bet is to go with an established or curated collection. Color seen on a monitor is very different from what we see in real life. Colors generated for digital use are created using a CMYK (Cyan, Magenta, Yellow and blacK) combination. The colors we see in nature are the result of combining the primary colors Red, Yellow and Blue. This is why matching or coordinating colors online is tricky. I wanted to maintain a color palette similar to the one used by Kate and Tammy. Not only do I love each color scheme but I felt it would make it easier for me to actually follow the instructions! In the interest of time but mostly convenience I felt my best bet was to purchase fabric online for this project. 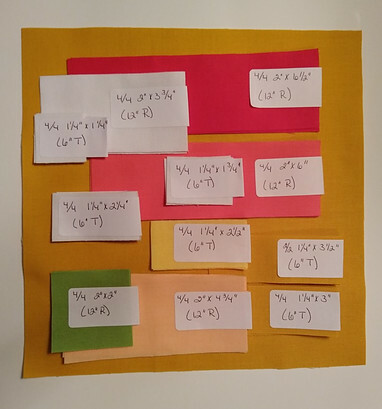 So, in order to get the right number of each color I had to chose two separate fat quarter bundles that at least appear, digitally, to coordinate. You can view my choices here and here. I realize this is not a new subject. I also recognize that anyone that has quilted or sewn anything has reached this same conclusion and developed a strategy or system for being able to store and locate the multitude of items needed to complete a particular project. So I don’t feel as though I have deciphered a secret code or located the Rosetta Stone of organization but in the early stages of this project I realized I haven’t read about anyone else system of organization and felt someone else out there could benefit from the fruits of my labor! 2. Adhesive tags or labels – I’ll use several sheets of address labels for this project. Once you begin to use them you will begin to discover many other uses as well. Generally, they are fairly cheap so no worries if you feel you bought too many. 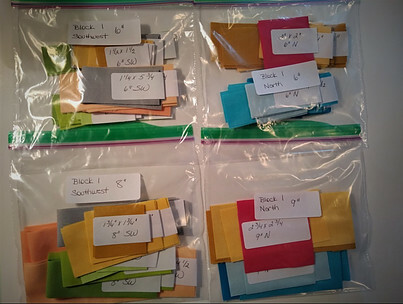 With so many colors to choose from and with so little variation in colors between the green, blue and red/coral I found it very helpful to first label each fat quarter. 3. Zip-lock bags. Four or five will do. They can easily be reused as you progress to the next block. At first, I began with only 2 bags. For better organization I again sub-divided the “North” and “South” into the different sizes and placed those pieces into separate bags. without having a meltdown (or two) along the way! As for me, I can easily “Quilt-A-Long” as long as I’m organized and take my time and I’m not bringing out the seam ripper too often! 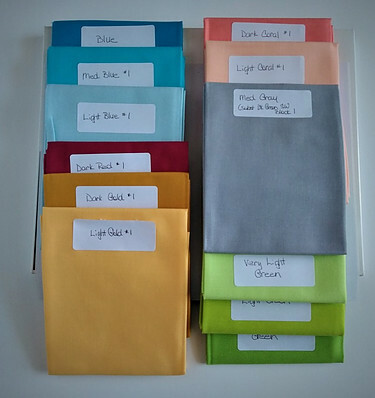 I’d love to hear your strategies for getting and staying organized with any quilt project. This is only my first quilt along but I feel organization is key to success. It prevents feeling too overwhelmed to begin the project and allow you to successfully continue with the project to it’s end. Want a Good Bag to Hold Everything? The designer/author’s intent was to create a bag large enough to hold and organize a wide range of sewing notions yet be easy to carry. This combination of genius design and fun fabrics was just too much for me to resist. A feew weeks ago I attended a quilt show hosted by one of our local quilt guilds. My initial intent was to look at all the beautiful quilts on display and vote for my favorites in each category, purchase raffle tickets ( to win a feather weight Singer sewing machine – never got a call so I’m assuming by now I didn’t win…) and sample a few goodies at the bake sale table. The pattern/kit was second-hand – I’m thinking a left over or unused kit from a previous class/workshop sponsored by this quilting guild sponsoring the show. It was in perfect condition and at half-price! As with any project, organization is key. I would suggest obtaining a shallow plastic bin with a lid before you decide on what fabrics and other tools you will need. If you are having trouble locating what you need when you need it, a project like this is likely to become a UFO – UnFinished prOject. Also, for many of us, this will not be a quick, get-it-done-in-an-hour or even “in-a-weekend” project. You will no doubt do – as I did many, many times, get it out, work on it a while and “life” will happen that requires you to put your project aside to come back to later. Being able to throw everything into a box and put a lid on it makes it much, much easier to return to and finish. Now, with that out of the way let’s take a quick look at my “Finished-Is-Better-Than-Perfect Beatle Bag”! A multi colored cotton print for the outer bag, a cream colored cotton for the inner bag and a linen look cotton for the straps, handles and accents. If / when you purchase the pattern you will notice I made more than a couple of substitutions in the materials list. This was done primarily to try to use what I had on hand without making a special trip to a fabric or craft store. You will also notice I made a few modifications to the instructions. The reason? I have an uncontrollable unwillingness to follow instructions. period. It’s one of my main weaknesses and it interferes and prevents me from getting anything finished in a reasonable amount of time. When I see just about anything, the wheels in my brain begin turning trying to figure out a way to: a) make the item easier to construct, b) make it more functional, c) visualize it in another color or d) just because I have to do things my way. Hindsight really is 20/20 and after constructing this cute little bag “my way” I encourage you to read and follow the instructions as they are written. Janice and Marcea at Abbey Lane Quilts have been doing this sort of thing way longer than I have – they know what they are doing and are very good at what they do! Just read and follow their instructions and you should have no trouble whatsoever creating your very own Beatle Bag! I had maybe one quarter yard of “Soft and Stable” foam stabilizer but oodles of quilt batting so the batting was used in place of the foam stabilizer. I intend to make another Beatle Bag and when I do I am considering using one-sided fusible quilt batting. That would be perfect for a small project like this. The basting is accomplished by ironing the batting to the wrong side of the outer layer. It’s a real time saver – basting takes much less time and as a bonus, you get to start the “quilting” aspect very quickly! My original intent was to use a 2 1/2″ unfinished wood ring (in place of the 2 1/8″ metal ring) however, as the construction of the bag progressed I elected to follow that particular instruction and went with the metal ring. I would have much preferred to use sew on Velcro – and I know there is a roll of it somewhere in my sewing closet but every attempt to locate it ended in complete failure. Miraculously I was able to find a small scrap that would work for the “pin cushion”, but I needed quite a bit more than that. This is all it took to get the wheels in my mind turning once again – “what can I use to substitute”. And in my search I was able to locate a few magnetic snaps left over from a previous tote bag project. Not the best solution – I’ll get into that later, but offers an alternative when the primary object is to get this bag finished in a reasonable amount of time. I also considered using ready-made quilt binding however, after much deliberation I decided the straps, handles and binding should all be the same. I seemed to me a geometric grid quilt pattern would serve to “tame” the busy movement of the print pattern. A variegated medium gray thread appeared to be the best solution to blend in when using so many colors and high contrast hues. Once the inner and outer pieces were quilted, the straps were sewn in and the binding attached to the edge, the inner accessories (pin cushion, scissors pocket and vinyl inserts) could be added. I’ve included a few of my own tools for demonstration purpose but believe me, this little bag will hold a lot more! 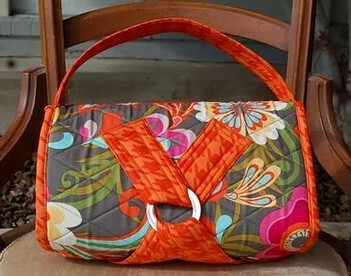 I can see this as a perfect way to carry and store a quilt-as-you-go project. Small items can be easily tucked away in a pocket and a partial lap or baby quilt can easily be folded and tucked inside. Once the bag is rolled up and the outer strap is fastened everything inside stays secure and in place. Below is a close up of the magnets I used and how they were placed at each end of the webbing used to attach the zipped vinyl inserts: I sewed a button over the magnet to hide the ugly metal clips and give the appearance of a true button. I alluded to this earlier, these magnets are not a perfect solution. I’m not crazy about Velcro however, these magnetic snaps are just a bit too large and too heavy for this project. Their fixed position doesn’t allow you to adjust the tension of this inner strap – something that would be useful to keep the insert taught to accommodate to changes in size and weight of the contents within the vinyl pouches. It is obvious binding is not my strong point but in all fairness, I’m not sure the fabric I used was entirely suitable for binding – it stretched SO easily and was prone to fraying. Taking a closer look at this I think the best option for me is to choose a fabric that allows me to use a ready-made seam or quilt binding tape. Making this Beatle Bag was the most fun I’ve had in a long time! The instructions were clear, easy to read and easy to follow. And not only was this a fun project it is one that allows you expand you skill set or enhance skills you already possess. 1. More about the characteristics of different fabrics. 2. The importance of following the instructions and make as few substitutions and modifications as possible. 3. How to make a pocket that is even on both THE bottom and top corners. 4. I need more practice cutting and sewing binding and straps. 5. 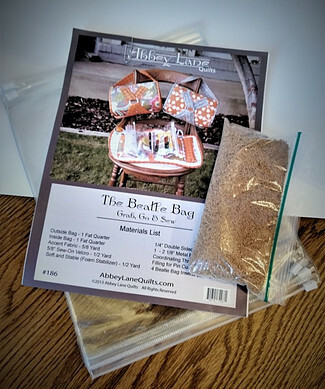 That I CAN’T WAIT to make another Beatle Bag as soon as I have the chance! If anyone else has made this or a similar bag designed to hold EVERYTHING I’d love to hear your comments and experiences. Is this the type of bag you often use? On a scale measuring degree of difficulty, where would you place construction of this bag? And as always, feel free to post an image of any type of organization bag you have made! When Does Housework Come Before Needlework? Lately, at least at my house, just about everything else in the alphabet has come before housework as well! The image above is NOT my house but for the past two months it may as well be. The best way to describe my home – especially my sewing room, is organized chaos. 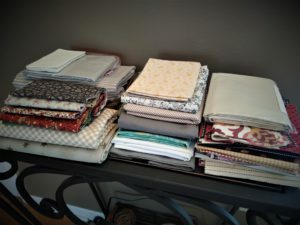 Stacks of books, baskets of fabric, bins of unfinished projects, bags of more fabric… However, I’ll save my “Sewing Room Blues” for another post. I read a quote earlier today that stated the best way to keep dust off your furniture is to top everything with stacks of fabric. Dust will to have work pretty hard to find it’s way onto this table-top! And here is a bonus tip – keeping fabric that is shipped to you in its original clear plastic wrap makes it a little easier to dust the “furniture” when that mood hits! So…since I’m admitting I haven’t done much housework lately, what exactly have I been doing? Quite a lot, actually. However, my focus has been making these cute lap quilts. The small lap quilts we make are given to our patients and their families when they transition to palliative or hospice care. However, – between the busy holidays, the ridiculous weather (thank you Polar Vortex) and a couple of bouts of some sort of flu / stomach virus / crud, our quilt group hasn’t had a chance to meet since November. As a result, almost every minute I’m not at work (or doing something that loosely resembles housework), has been spent making a few lap quilts – four are completely finished. I’m taking a break from piecing the fifth to write this short post! The first is made from a 6″ Jelly Roll featuring reproduction civil war prints by Boundless fabrics. These are left over from the jelly roll I bought over 2 years ago and this particular fabric is forever sold out. 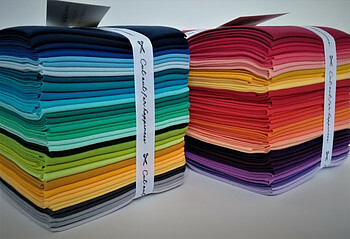 However, Craftsy (now called Bluprint) carries this exclusive fabric line and many other fabric choices are always available. For this specific project I chose shades of red and blue fabric strips paired with an ivory background. Since the strips were 6″ x 42″ I cut the strips into 6″ squares and the ivory background into 6″ strips as well. Then I paired the print with a solid or a red with a blue and made into HST’s (Half Square Triangles). Using my portable design wall I arranged and rearranged the solid squares and HST’s until I found the configuration I liked. I’m calling this one Star Squared. (No doubt there is a block or quilt already made with this pattern that goes by another name – I welcome anyone willing to correct me on this!). Once I created the star consisting of the 16 inner squares it became apparent this original size, even with a typical 3″ border, would not be large enough. Being a design consisting of HST’s and squares it seemed reasonable to sew a few more HST’s and simply add them (and few more solid squares) to the perimeter. Now I was having fun! 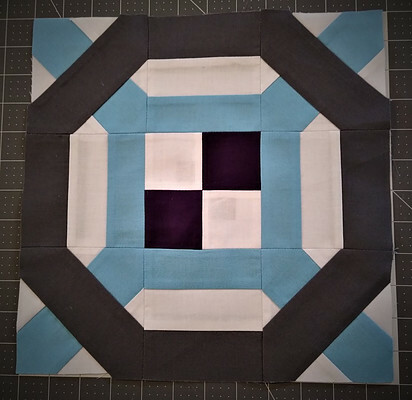 Arranging and re-arranging these squares to find the right configuration is actually quite fun and it is amazing just how many designs and configurations you can create with these little HST gems! This next quilt is made from 2 charm packs – the print is “Voysey” from the V&A Archives for Moda. The solid is from the “Caramel Macchiato” fabric line from Wilmington Fabrics. Both were “Daily Deal” bargains I purchased from the Missouri Star Quilt Co. and the “On-Point” pattern is an adaptation from one of Jenny Doan’s YouTube videos. The colors are wonderful and the print is a folksy print that reminds me of William Morris’ craftsman style design motifs from the late 1800s. I wish I had better lighting for this image. I’ve chosen to take these images in my front room – even a quick ray of sunshine would make a huge difference! These next two quilts are made from fabric donated to our quilt group. I took the liberty to create a basic pinwheel design for the top quilt and the pattern for the second top is from a sketch hand-drawn on a piece of scrap paper. I don’t recall if it has a specific name but the pattern kind of reminds me of a baseball field so I’m naming this one “Home Run”. There you have it – how I survived (and continue to survive) the Polar Vortex and why a dictionary is the only place where housework should come before needlework! Leave a comment and share how you are surviving this insanely cold weather and please feel free to include an image showing us what you put before housework! It doesn’t have to be sewing/needlework – it can be anything! I can’t be the only one who puts just about everything before housework! So, once your chilly body parts are warmed it would stand to reason this warmth would naturally extend to your heart and soul as well, right? Now we have the “what” and “why” settled, it’s time to tackle the how = easy and the when = quickly! Fun fabrics plus a need for heat equals – DIY Rice Bags and Cover! This is a project that is quick and easy because it only involves sewing straight stitches – no piecing together a complex pattern or even true quilting for that matter – unless of course, you want add that extra touch. These little gems are wonderful! I was introduced to these many years ago from a friend who also taught me a new weaving technique. Over the years we have lost touch but I’ve never forgotten her “microwave rice bags”. Each year as Christmas draws near and I begin to make my list of gift recipients I try to think of giving something unique yet useful…something I would want to receive. After a little brainstorming, the idea to make rice bags once again surfaced near the top of my gift-giving list. This is something that can be as easy or as complex you want it to be. They can be customized, personalized and re-used over and over. The cover is removable and washable so they are as easy to care for as they are to use. The image above shows the single handled striped inner bag (before it was filled with rice) along with the cover made from the snowflake printed fabric. IS THIS PROJECT AS QUICK AND EASY AS IT LOOKS? My first attempt with a project like this was about 20 years ago and the only sewing I did was for the cover. The rice filled hot pad was actually a sock that I sewed closed. Very utilitarian – it did the job but wasn’t much to look at. I’m now at a point in my life where I have the time and resources to bring together a little higher level of form and function. This particular rice bag is, in some respects, better than my first however, during the construction process I began to think of better ways to do this. No doubt, I will probably make several of these and anticipate during the process I will make improvements on both the technique and appearance and will post as an update in the near future. 1. Choose two different fabrics you would like to use. Fat quarters are great size to begin with and for one rice bag you will need a total of (4) fat quarters – or (1) yard of fabric total. This translates as follows: (2) fat quarters or 1/2 yard for the bag and (2) fat quarters or 1/2 yard for the cover. When finished, if a larger or smaller size is desired then it is easy to adjust the measurements. 2. For my project, I cut (2) rectangles, 18″ x 7″ from the striped fabric. Next, I cut (2) rectangles, 20″ x 8 1.2″ from the snowflake print. 3. The top edge – and only the top edge – of all four rectangles need to be folded and stitched. This creates a finished opening that doesn’t fray. The other three sides will be sewn to the matching fabric with right sides together. I began with folding down 1/4″ on the short (top) side of each striped rectangle and press. Fold again another 1/4″, press and stitch along somewhere around an 1/8″ from this folded edge. This is where I began to have one, of many, “I-should-add-_____-to-make-this-pretty-and-or-more-functional” ideas. This time I felt having a handle attached to the rice bag would be useful and serve at least two purposes. 1. To make it easier to hold the bag steady while sliding the cover on or off. 2. Use the handle to place the bag closer to your skin or keep in place if wrapped around your leg or shoulder. 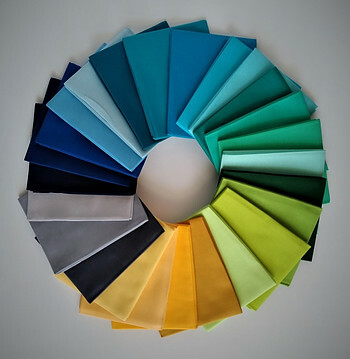 Another confession: I love fabric selvages – especially those with a nice fringe, written text or sample colors used in the manufacture of the fabric. Since the striped fabric is a woven ticking fabric with a nice even fringed selvage, I decided to use about am 8″ length to create the handle. Placing the right sides together (with the woven material I chose here, both sides look the same) I stitched the remaining three sides together, clipped the corners, turned right side out and pressed flat. The top right image above shows the finished bag ready to be filled with rice. Whether you choose to add a handle or not don’t fret about the appearance of the inside edge. Once it is filled with rice this entire opening will be sewn closed and out of sight. At this point you have a couple of options. The easiest would be to fill the entire bag about 2/3rds full of rice, sew closed and call it a day. Those who know me also know I’m not known for ending a project so quickly and “calling it a day”. Where is the story in that? Pondering on the size of this bag I felt the finished bag would be easier to drape and fold if it were divided into separate compartments. I like the number three so I went with that! Three compartments would only require two additional stitch lines. I simply divided the length of the bag by 3 and used an air soluble pen to mark each of the two stitch lines. One stitch line may be enough but this particular bag is a little large and rice can get heavy AND it’s much easier to prevent ripped stitches than it is to go back and repair later. A bag like this will get a lot of wear and tear. Now, back to the bag! No exact measurements are needed – this is something you can just eyeball. Once the lines are drawn, go ahead and fill with rice. Again, no exact measurements here – I just filled enough so the rice came to about 2/3rds the distance between the bottom of the bag and the two stitch lines. Sewing the first dividing line was easy. Sewing between the second and third compartments was another story. Using one hand to keep the rice pushed to one side of the sewing line was almost impossible. After a couple of trials and twice as many errors I had another one of those “light bulb” ideas. The solution? A clear glue stick! In fact, after using it for the 2nd and 3rd compartments I’m recommending using it for the first one as well. It’s easier to do than it sounds and will save you tons of frustration and headaches. 1. Use a large scoop or spoon and funnel and pour rice into bag. 2. Fold top of bag down and using one hand as a guide, reach inside with the other holding the glue stick and glide the glue around the bag where the marked stitched lines are located. 3. Pinch and press closed then take to the ironing board and run your iron for 3-4 seconds over the glue strip. It isn’t permanent but will hold long enough to walk to your sewing machine. 4. Position to lay flat and stitch along both lines. 5. Return to upright position and repeat steps 1-4 for the next compartment. 6. The final step is the easiest – glue around the inside at the top, iron closed then stitch. 7. The bag is now finished! After finishing the bag you may be thinking – “I’m not sewing another stitch… I’m done”. But let me assure you, this next part is really super quick and easy. Just sew together two pieces of fabric, turn right sides out and call it a day. I will admit, that was totally my original thought however, as is typical of me, I began to have more of those “how-can-I-make-this-prettier” ideas and one of those ideas involved using some left over piping across the top edge to give the cover a more finished look. The first image below shows the process of adding piping to the right side along the top (short) edges that will become the opening for the cover. Once the piping is attached to both edges place right sides of the fabric together and stitch a 3/8″ seam around the perimeter to join three sides (exactly as you did with the rice bag) leaving the top end (with the piping sewn on) open. Next, clip the corners, turn right side out, press and it’s ready for use! Since rice is somewhat large, I hung the rice bag from the handle then slipped on the cover by sliding it up. When ready for use slide the cover off and place rice bag in the microwave. For a rice bag this size it may take as long as 2 minutes to fully heat. Start with 1 minute, turn the bag over and heat for another 1 minute. Be careful, as these bags are HOT! If your heart, soul and anything else needs a little cooling down, these bags can also be used as COLD PACKS! Place them in the freezer for 1 – 2 hours, cover and use as needed! Has anyone else made rice bags like these? I would love to hear about your experiences – what worked – what didn’t. Please feel free to share any tips or suggestions to help me and others improve upon this design! The Quickest, Easiest & Cutest Christmas Ornaments I’ve Ever Made! Shiny objects, cute puppies, cinnamon rolls, buffalo plaid, pretty fabric and, of course, anything Christmas, just name a few. 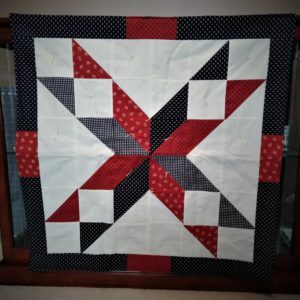 Another weakness (as the title of my site would suggest) is quilting and sewing however, the specific pattern or design that is making me swoon these days is the pinwheel pattern. 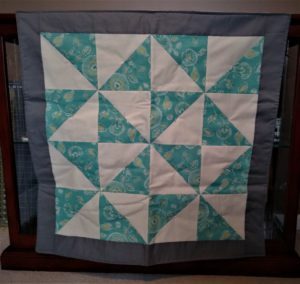 The minute I felt like I had mastered the techniques of sewing squares together I decided to bite the bullet and give making a quilt top using the pinwheel design a go. 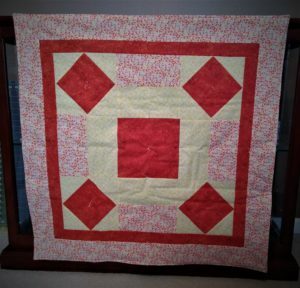 As beginning quilting or quilt piecing goes, triangles and pinwheels are not typically anywhere on any list of quilting and sewing techniques suggested for a beginner – like me. But how can one resist? The pattern has such a fun and playful appearance and the potential color combinations is, if nothing else, inspiring. With all that going in its favor what is all the fuss? Piecing all those triangles can’t be that difficult! tops shown above were actually not that difficult to make. point to perfectly match up with an adjacent point or corner. But all that fuss is for another day. Today, I want to show you a super quick and easy way to create a fabric ornament into the shape of a 3-dimensional pinwheel. These can be used on a tree, to embellish a gift bag or applique onto a pillow. This is a design that with just a change of colors or design motif can be adapted to any season of the year! A project like this is also a great way to use up those fabric scraps or remnants from a precut bundle. For these ornaments I’m using left over fabric from last year called “A Moose for Christmas” – a fabric line by Cheryl Haynes for Benartex fabrics. This particular fabric line may not be available in your local fabric store but it can still be purchased here. 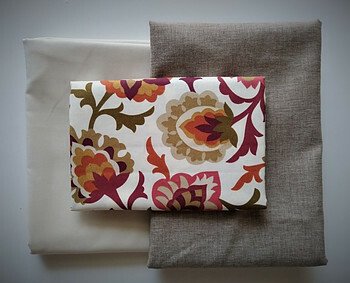 (2) 5″ squares of fabric – (1) print and (1) contrasting solid. Place each fabric square with right sides together. Stitch around the entire perimeter of the square leaving about a 1 1/2″ opening for turning. NOTE : The opening shown in the 3rd image above is almost too small. I was able to turn the square right side out but it was a bit difficult. Don’t be afraid to make the opening closer to 2 or 2 1/2″ – closing it later will still be very quick and easy. Use a long thin object with blunt end (chop stick, paint brush) to push out the corners and smooth the edges then press flat. Turn the square so the solid side is face up and mark a 1 1/2″ line from each of the four corners toward the center. Once marked, take a sharp pair of scissors and cut on each of the four lines from the corners you just marked. 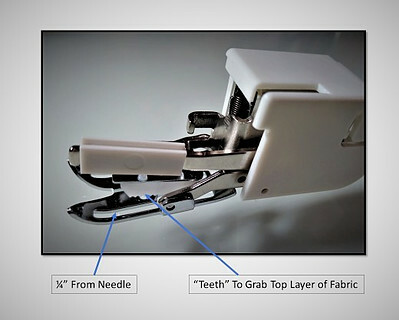 At the sewing machine, stitch 1/4″ from every open edge. It’s a little tricky sewing around each of the cut lines but using a 1/4″ presser foot with a metal “fence” is a perfect guide. If the points are somewhat ragged or uneven this is a good time to once again use your sharp scissors and just trim off any excess you don’t want showing. Next, fold up every other point toward the center. A small drop of glue can be used here or – you can do as I did – fold up one corner at a time and secure with a stitch until all four corners are folded. Stitch a button or other embellishment in the center. This gives the ornament a nice finished appearance and hides the tips of the folded corners. Stitch a small loop on the back to thread an ornament hanger. Stitch a larger loop to be used as a hanger. 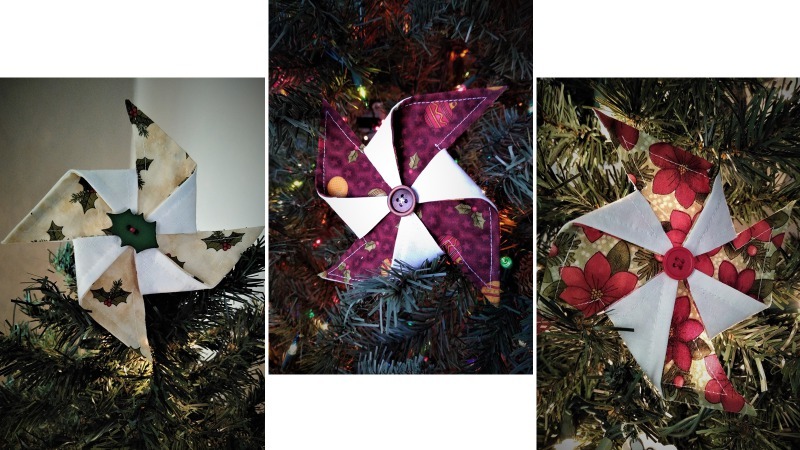 UPDATE: New images showing how these Pinwheel Ornaments look when placed on two of my indoor Christmas trees.